Every day, along I-15 near Las Vegas, dozens of birds fly into concentrated beams of sunlight and are totally incinerated. 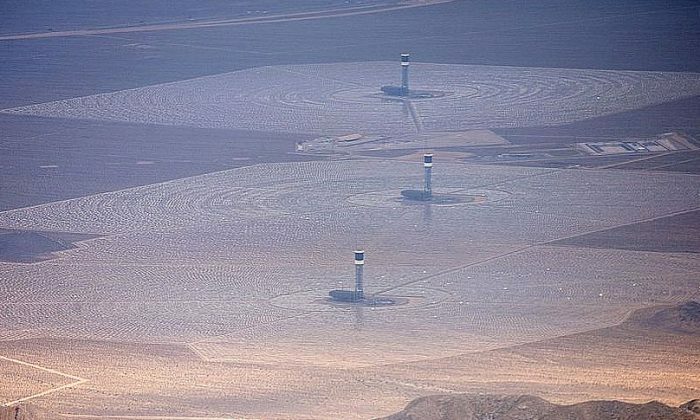 At the 390-megawatt Ivanpah Solar Plant, 6,000 birds per year are utterly destroyed, leaving behind only white smoke, according to the Los Angeles Times. The issue began in 2014 when the plant opened. Workers at the plant, seemingly acknowledging how commonplace the bird deaths are, call them “streamers,” as they leave wisps of smoke as they burn in the sky. The plant uses giant mirrors over 5 square miles to focus beams of sunlight into massive towers. The sunlight can be used to power up turbines inside, generating energy for the power grid. Officials have said they’re trying to come up with a solution, but their progress has remained “modest” at best, the Times noted. Meanwhile, coyotes have been eating roadrunner birds that get trapped along the plant’s fences designed to keep desert tortoises out of the plant. The firm plans to cut holes in the fences to allow roadrunners to escape. The facility—a joint-venture between NRG Energy, Google and BrightSource Energy—cost $2.2 billion to build. It was subsidized with an Obama administration $1.6 billion loan guarantee.